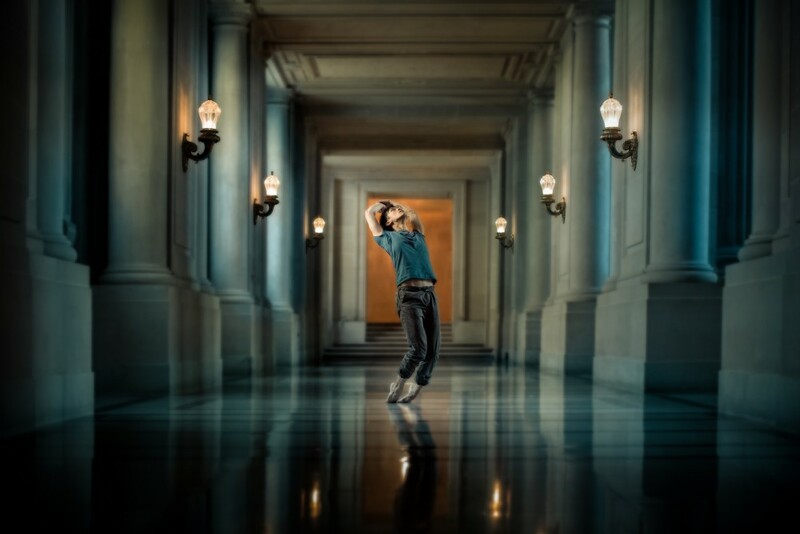 We want to share a guest post by Mickael Jou, he shares amazing self-portraits of himself dancing and levitating. 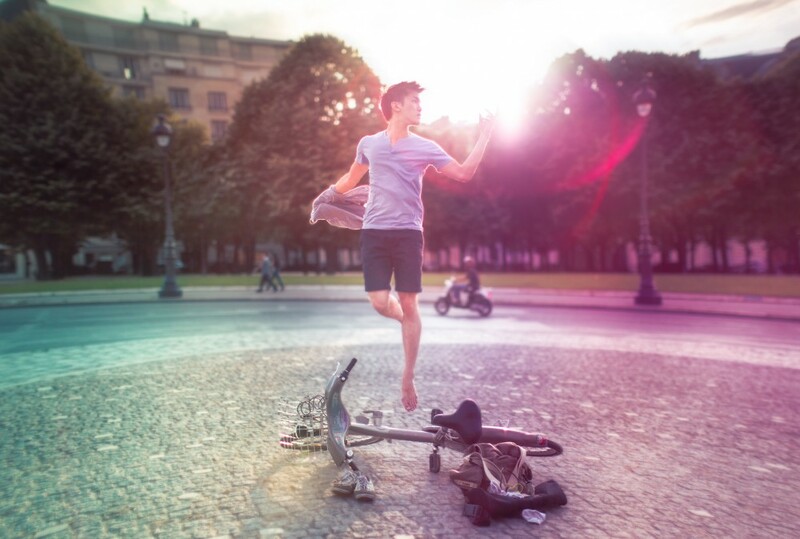 He also shares self-portrait tips from his 365 ‘dance self-portrait’ project. 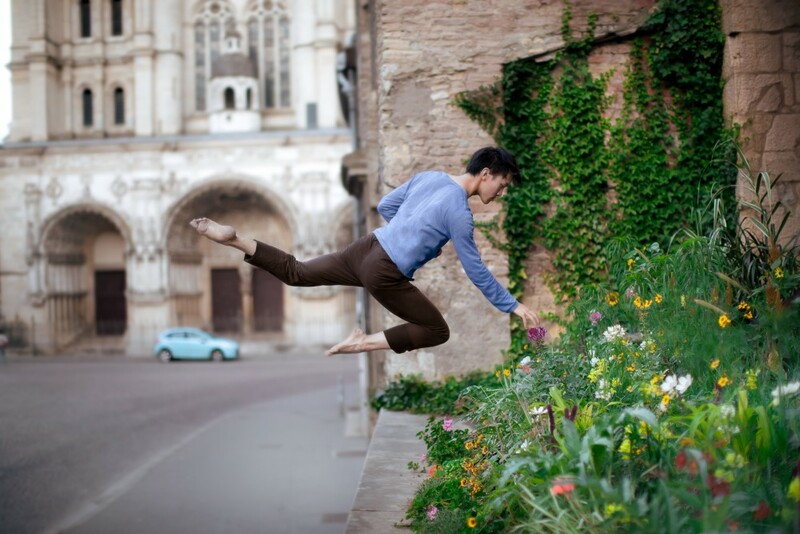 Mickael used to dance ballet and modern dance, in the streets of Paris. 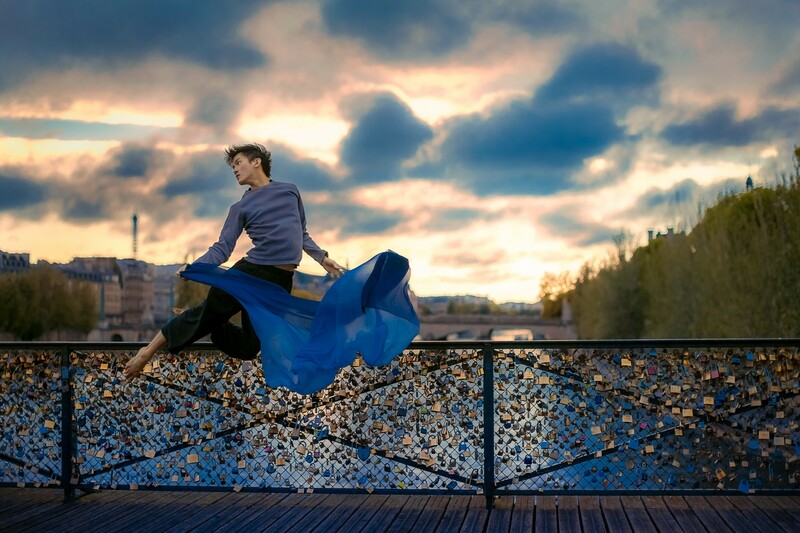 After seeing pictures that tourists and amateur photographers had taken of him, he decided to buy himself a camera and express his dance through photography. 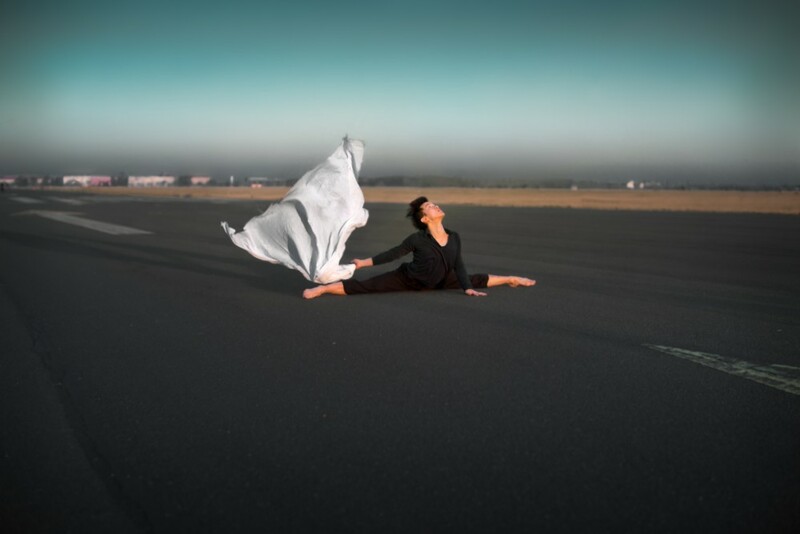 And then I started my 365 ‘dance self-portrait’ project, which I’ve been doing for almost 3 years now. I’ll probably need another 3 years to complete it. In the beginning, I read some advice for beginner photographers, the most important being to always practice and take risks. The following 12 points, however, are things that I’ve learned through my self-portraits. These are things that I constantly tell myself to motivate and encourage myself. Becoming a better photographer takes time and persistence. Oh and by the way, I don’t photoshop myself into my photos. I’m just really good at jumping and jumping very high. If you’re familiar with weightlifting, I can back squat almost twice my body weight. Some people enjoy getting up at 4am, I don’t. That’s not my thing. I don’t like getting up early but that doesn’t mean that I am not working hard to create good pictures. I just don’t do it at 4am. Be realistic about how much time and effort you invest into your photography. This isn’t a sprint, it’s a marathon. No one became an expert over night. If you are forcing yourself to do things you don’t want to do, chances are that you will quickly jump ship. Be good to yourself, be good to your camera. Everyone wants to please. But you can’t please everyone, and this is fine because you are going to see a lot of pictures that don’t please you either. Take criticism from those who know what they are talking about and ignore the others. The others are probably also those people taking some pictures you find horrendously ugly. But hey, everyone has their own style and this is why photography is an art and not a science. I used to take suggestions from people on how to frame or retouch a picture. How should I adjust this picture? What should I do different? I thought that being open to feedback was good but I quickly realized that I didn’t like the result. There’s nothing worse than being stuck with a photo that you don’t like just because you thought you should listen to someone else. 4. Your inspiration is your best friend. If you don’t have one, get one. Listen to your inspiration, such as, what you enjoy photographing. Maybe it is the sunrise at 4am, maybe it’s bridges with graffiti, maybe it’s fruit stands in Asia, or naked models wearing nothing more than glasses. Listen to your inspiration and focus on them because that will take you further, a lot further than making yourself take pictures of things you don’t like or find ugly. 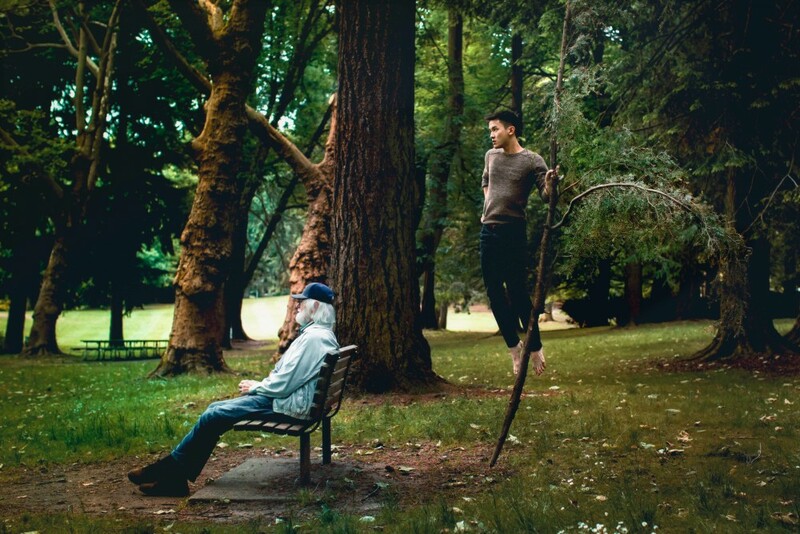 When I first started my 365 photography project, I received a lot of questions about why I was doing the project, why always me, why not other people, why always levitating or dancing. I thought it was important to have answers to those questions and lost time and energy which I could have used to answer more important questions: How should I be framing? What is good composition? Where is a good location? How can I stop this back pain? After about a year of doing my project I didn’t get any more questions about the ‘why’ of my project. I had just become good enough at my self-portraits so that people stopped second guessing what I’m doing and why. Which now leaves me with a lot more time for photography, and my back pain treatment. 6. Someone will tell you to stop photographing. Don’t listen. Someone, somewhere along the way, will tell you to stop photographing. Maybe it’s your mother who thinks you’re wasting your time. Or some security guard who’s telling you that it’s forbidden to photograph here. Or a friend telling you that you should do landscape photography because that’s so pretty or wedding photography because that’s where you can really make money. Just don’t listen. Be adventurous and brave. Do your own thing and once again listen to what inspires you! 7. Stuck? Take a break. Everyone has bad days including photographers. Inspiration gone? Stuck in a rut? Give yourself a break. Go for a run, eat something really fatty, indulge yourself. Then maybe, just maybe, your creativity will indulge you back. Go to a museum, buy an art history book, find someone who is an art history fan and get private lessons. Classical paintings are the best way to learn about balance, lighting, settings, composition, etc. Sad truth but it’s the truth. Someone already did what you’re doing and they probably did it for a lot longer than you. Which means they probably did it better. But just because what they did is better than what you’re doing now doesn’t mean that one day you can’t/won’t exceed what they did. Focus on your own progress not on the gap between you and others. I’m sorry but I have never heard of a camera that automatically boosts orange tones, and then blurs out everything except for the 4th quadrant. Today post-processing is a part of photography, a very important part. Most likely the photos that you enjoy looking at are heavily post-processed, so get on the train! One must be well acquainted with Photoshop in today’s world! 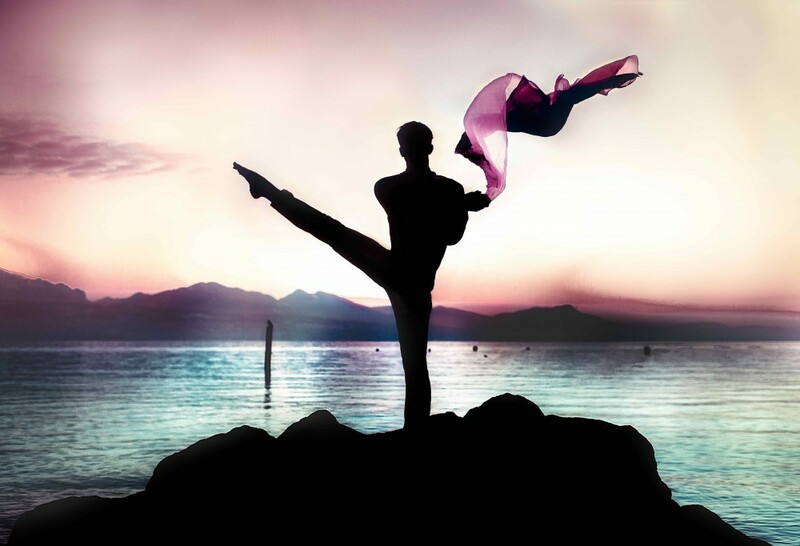 I had this idea for a dance pose that I carried around for year with me. I just hadn’t found the right time or the right location for a photo. And then one day, as I was annoyed that my photography wasn’t going well, I pulled this dance pose out of my memory and it turned out quite well. Give things time. Your idea might be great but it might not be quite ready to put it into action just yet. 12. Believe that what you’re doing is different and better. And someday it will be. 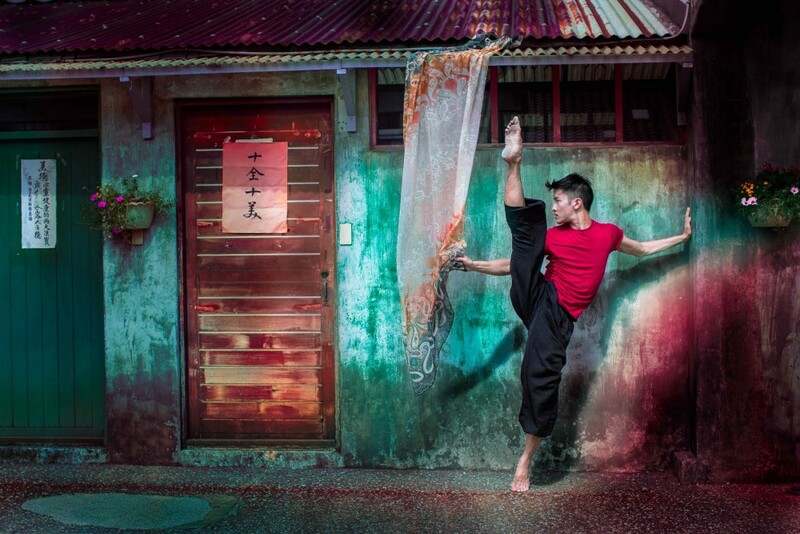 15 Comments on "Dance Self-Portrait Photography"
Great post with awesome images. Very good, poignant information. Very inspired, vibrant & gracious photography ! It’s impressive to see that those are self-portraits, and then require quite some technical skills (beyond the dancing) ! Just beautiful ! Congratulations! Great pictures! The last one is the best, in my opinion! Where it’s take Mickael Jou? Wow, great pictures! 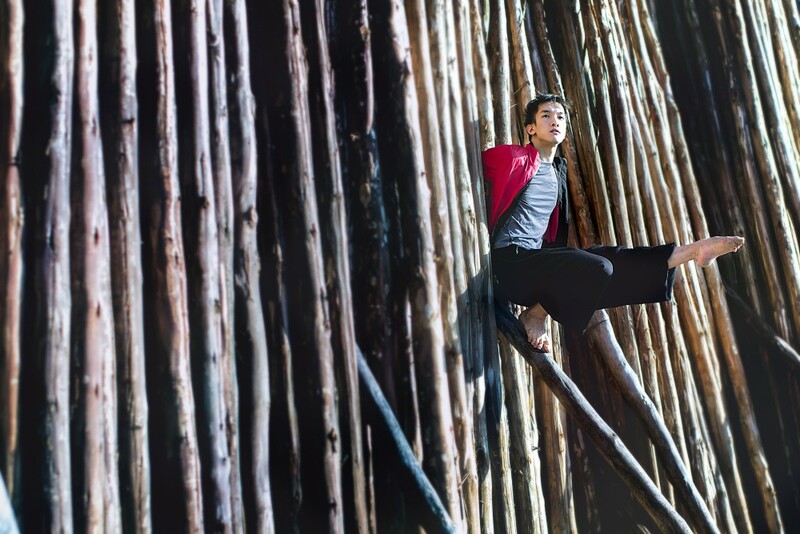 Mickael’s commitment and dedication are definitely ones to admire! These are really amazing pictures. I can tell the photographer has some great skills. To achieve these fast moving pictures, I can only assume that your shutter speed was very fast. Great Article. #6 is one I most need to hold onto. The position, the light and that space are really expressive.